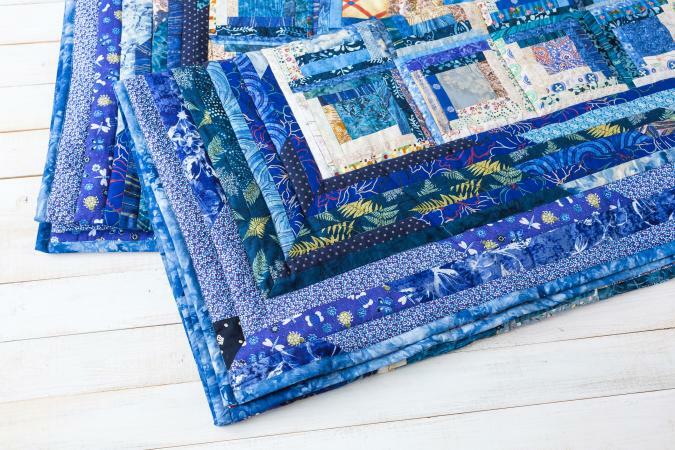 Quick and easy quilting projects are perfect for those who don't have a lot of time on their hands or are new to quilting, but want to make colorful and creative blankets, pillows or wall hangings. How much time do you have to complete the item? Where are your strengths and weaknesses in regards to quilting? Are you going to use a machine or quilt by hand? How much you want to spend on your project? If you are looking for something simple, a king-size quilt is probably out of the question. Take your time and check out some quilting forums, browse through your favorite fabric store or read through a few books for the perfect idea. Colorful quilted wall hangings make wonderful gifts. They can brighten the walls of a new home or even a child's bedroom. You can create one for a specific holiday or home decor theme. The Peacock Swallowtail Freestyle Quilt Wall Hanging makes a great decoration to welcome spring into your home. The In the Pines Wall Hanging kit uses geometric shapes. You will need a few extra tools and items to complete this hanging. The Roly-Poly Cat Fun Wall Hanging highlights bright colors and basic shapes. Smaller quilted blankets and lap quilts are simple to make and great gifts to receive. This Arctic Polar Pals kit makes an adorable and unusual blanket for your little one. Pre-quilted panels can be made into simple baby blankets by adding a binding or trim. Easy Small Quilt uses a useful basic quilt block. Create this baby blanket or lap quilt in just hours. Nothing decorates a bedroom or living room more than colorful throw pillows--also known as "quillows." Most are very basic to do and few supplies are needed. The Country Home Patchwork Pillow is an easy project for beginners and can be completed in less than a day. The Quillows Quilt Pillow takes two pre-quilted fabric panels and makes remarkable pillows out of them. Quilting kits are your best for quick and easy quilting project. You don't have to worry buying, measuring or cutting fabric. Everything you need to complete your item is included. Connecting Threads offers many kits including those for wall hangings, blankets, table runners, and more. The Stitchin Post has a variety of quilt kits available in many different styles and sizes. To minimize thread damage to the fabric, cut all four corners off the material before you wash it. Wash and press the fabric before you start. Make sure you follow the fabric's grain when cutting and sewing. When setting a seam, do not use the steam setting on your iron. This will cause the fabric to pucker. When sewing the quilt's binding, use quilt clips to hold it in place. Roll your quilt onto to an empty wrapping paper tube to avoid wrinkling or creases. Cotton or cotton-blend batting is the easiest kind to add to a quilt.